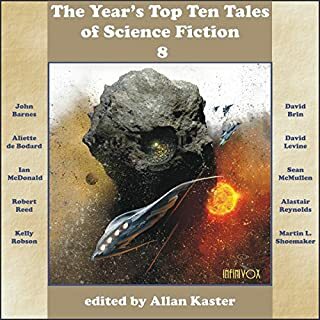 An unabridged audio collection of the best-of-the-best science fiction stories published in 2015 by current and emerging masters of the genre, edited by Allan Kaster, as narrated by top voice talents. 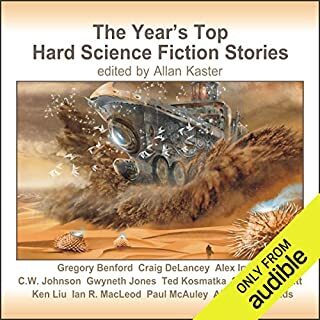 An unabridged audio collection of the "best of the best" science fiction stories published in 2014 by current and emerging masters of the genre, edited by Allan Kaster, as narrated by top voice talents. 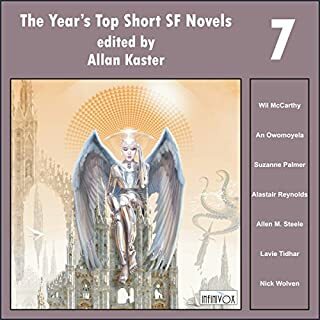 Short novels are movie-length narratives that may well be the perfect length for science fiction stories. 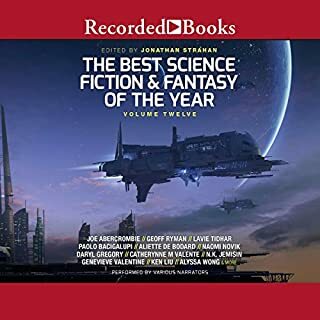 This audio collection presents the best-of-the-best short science fiction novels published in 2014 by current and emerging masters of this vibrant form of storytelling. The aliens are here. And they want to help. The extraordinary new project from one of the country's most acclaimed and consistently brilliant SF novelists of the last 30 years. The Jackaroo have given humanity 15 worlds and the means to reach them. They're a chance to start over, but they're also littered with ruins and artifacts left by the Jackaroos' previous clients. 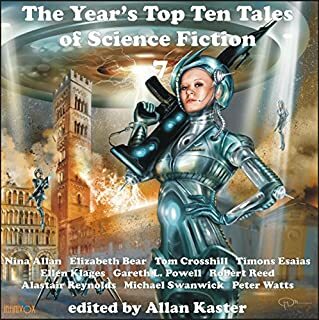 An unabridged audio collection spotlighting the best of the best science fiction stories published in 2016 by current and emerging masters of the genre, edited by Allan Kaster, as narrated by top voice talents. In "The Art of Space Travel", by Nina Allan, the staff of a hotel prepares for the crew of a one-way mission to Mars on the heels of earlier disasters. 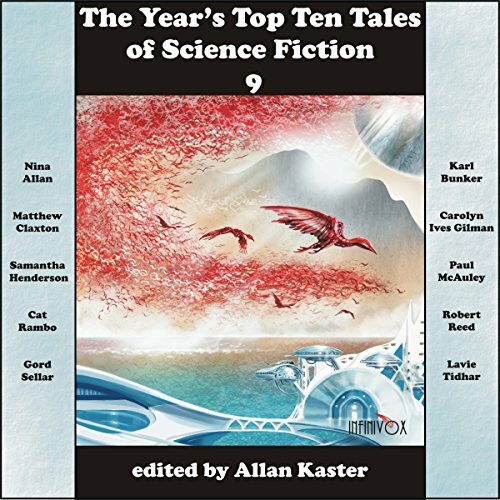 An artist and his wife search for fulfillment in a utopian world created by AIs in "They Have All One Breath" by Karl Bunker. In "Patience Lake" by Matthew Claxton, an injured military cyborg helps defend a farm family that has helped him. In a top-secret job, an all-too-conscious bus driver takes a non-cognizant alien and his human translator on a tour of the United States, in "Touring with the Alien" by Carolyn Ives Gilman. In "My Generations Shall Praise" by Samantha Henderson, a woman on death row is persuaded to have her mind overwritten so that a wealthy relative can use her as a host body. People adapting to a melted Antarctica evolve new folklore, superstitions, and myths in "Elves of Antarctica" by Paul McAuley. In "Red in Tooth and Cog" by Cat Rambo, a woman acquires a keen interest in the small domestic appliance AI ecosystem that evolves in a park after her phone is stolen. An ancient robot tells a human how it helped build the Great Ship, a planet-sized starship, from hyperfiber in "Parables of Infinity" by Robert Reed. In "Prodigal" by Gord Sellar, an uplifted family dog questions the relationship between dogs and humans and then takes action. And finally, in a Bradburyesque tale, people go to Mars via cheap, one-person, one-way spacecrafts called jalopies in "Terminal" by Lavie Tidhar. The story mix on this edition in the series is above average, with excellent stories from McAuley, Reed, Cat Rambo and Gord Selllar. The narrators are generally good - I'm a fan of Nancy Linari's weirdly precise reading style, and Tom Dheere's nicely laid back approach. But as I have suggested on other reviews for this series, somebody please tell Tom Dheere to drop the accents. For one thing, they're pretty terrible, and for another completely incorrect in his rendition of accents in McAuley's 'Elves of Antarctica': two characters are from the Pacific, one from Tahiti, the other from The Marshall Islands, via Auckland New Zealand. Dude, people from the Pacific don't have Cockney accents! Enjoyed a few of the stories in this group. Narrators did exceptional job. 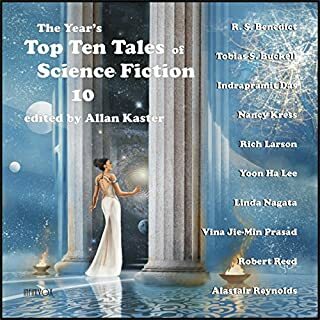 A good review of the year's stories. Good stories ... but is it meant to end this way? Some good stories, generally well read. Love the feral kitchen appliances and renegade bio-engineered dogs. But the book ends so oddly - not just mid-story by apparently mid-sentence, that I can't believe there isn't a technical problem waiting to be fixed.